If you’ve been a good little boy or girl, then you can look forward to a visit from Santa Claus on Christmas Eve. Of course, you’ll be snuggled up in your bed, visions of sugarplums dancing round your little heads and hoping that Santa will bring you something wonderful and perhaps magical. But what if you’ve been a naughty little boy or girl? What if you’ve spent the better part of the year pulling pigtails, teasing the cat, cheating at “I Spy”, refusing to eat your Brussels sprouts, not sharing your Lego? Well, you’d better brace yourself for a visit from the Krampus. He’ll poke and prod and beat you with a stick – and worse. I admit he was new to me, so I did a bit of digging. The Krampus originated in a very old European tradition dating from pre-Christian times, with influences from Northern and Germanic legend. He might be the son of Hel, the Norse god of the underworld, but it’s also been suggested that he was specially created to be a kind of foil to St Nicholas, a “bad Santa” if you will. The Krampus traditionally “appeared” on 6 December, which is St Nicholas’ Day too. His name is derived from the German word “krampen” meaning “claw”. The Krampus is well known in Germany, Austria, Hungary, the Czech Republic, Slovenia and elsewhere, and is now also becoming a popular figure across America. Good grief, there’s even a 2015 movie about the creature starring Toni Colette, and let me tell you – it’s no Home Alone. So exactly who or what is the Krampus? He’s a huge frightening creature that looks as if a mutated goat has been crossed with a Komodo dragon and then put through the wringer. Furry body, clawed hands, sharp fangs, pointy horns, sneering face – just one look at him can scare you witless. And yet he’s apparently the travelling companion of St Nicholas. But while good old Santa leaves behind a lovely treat, the Krampus will beat you with stout branches. And that’s if you’re lucky! He might prefer to shove you into his dirty sack, drag you back to his disgusting lair and maybe even eat you up as a midnight snack. In the Middle Ages the church tried to outlaw any references to the Krampus because it felt he was a pagan version of Satan, but no matter how hard they tried, he stuck around. People love their myths, not to mention a bit of horror. 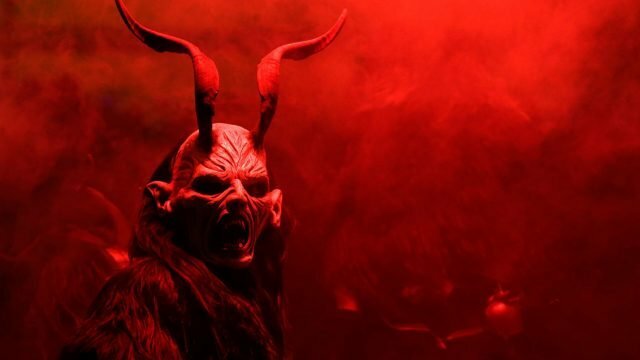 In Austria and Germany, Krampus Night is still held annually to scare children and there are also adult Krampus festivities where (usually) drunken people dress up in demonic outfits and roam the streets trying to frighten the bejesus out of everyone. I venture to suggest that drunken louts in a parade is far more frightening than an ancient folkloric figure, but it’s Christmas-time and in the spirit of goodwill I’ll give them the benefit of the doubt. A visit from Santa Claus has long been used as a bribe to keep children from misbehaving in the lead-up to Christmas. The Krampus is kind of like Santa’s polar (sorry!) opposite – his judgments are harsh, so naughty children had better watch out, they’d better take care, as the song says. But he’s not intended to be the “anti-Santa”. Originally St Nicholas and the Krampus worked together to either reward good children (with a gift) or punish naughty children (by giving them a lump of coal). There are similar myths in other cultures. For example, in the Netherlands, Sinterklaas’s sidekick is Zwarte Piet (Black Pete), and in other German traditions, Santa is accompanied by either Belsnickel or Knecht Ruprecht – none perhaps as threatening as the Krampus but not creatures you want to have much to do with. Like any mythological creature, the reputation and appearance of the Krampus have metamorphosed over time. He’s grown even uglier and has no qualms about hitting children or taking them away from their homes to live in Hell for a whole year. Really, it makes a naughty kid yearn for a piece of coal. Hopefully, it’s not too late for you to be good because it’s not only Santa who sees you when you’re sleeping and knows when you’re awake, who knows when you’ve been bad or good…well, you know the rest.